Whippets are slender and graceful and resemble Greyhounds. 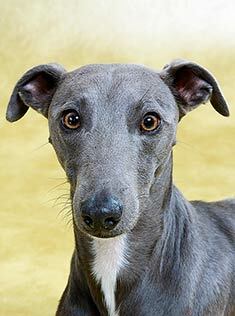 Overall, the Whippet is a very streamlined, elegant dog with slim features, rose shaped ears and an arching neck. Whippets may be a variety of colors including brindle, black, red, fawn, tigered white or slate blue, either solid-colored or mixed. Clean and odor free, Whippets' soft coats require only occasional gentle brushings. Intelligent and laid back, Whippets are calm indoors and considerably sweet and docile. Whippets are independent and can never be fully trained. They require gentle training as they are sensitive both mentally and physically. A Whippet will thrive when training involve games with running. Whippets have been known to chase down and kill cats, but will be okay with a cat that they have grown up with in the house. Whippets are prone to having upset stomachs and skin problems. The Whippet can be expected to live about 12 to 15 years. A Whippet should be allowed to run free in a safe enclosed area; however if given the opportunity it will chase and kill small animals. Whippets are sensitive to the cold and should be made to wear a coat in the winter time. What does a Whippet look like? This medium-sized dog stands between 17 and 20 inches high and weighs from 25 to 40 pounds. Males are generally one or two inches taller and three to six pounds heavier than females. There is no specific standard for the color or pattern of the coat, as coat color is not considered relevant to the dog’s racing purpose. The fur is short and easy to care for. These dogs are generally very thin and lean, as befits their racing heritage. Their fur is short and does not keep them well-insulated in cold climates. Some say there is a long-haired variety of the dog, but these are generally thought to be mixed breeds and are disqualified from showing and racing events. Do Whippets have a nice temperament? These dogs are sweet and lovable, good with people young and old, as well as with other dogs. They may bark at strangers, but they are friendly and not suited to work as guard dogs. Barking is not excessive, making them a good choice for apartment living. Strongly independent, many Whippets don’t believe that training is for them, and they may be hard to housebreak. In spite of their independence, these dogs are most content when close to their families, even to the point of spending a great deal of time in a lucky person’s lap! Careful and continual exposure to a variety of people and places can help the Whippet to overcome his shyness and become comfortable with strangers. Because of their hunting heritage, Whippets are prone to chasing anything that moves. Secure fencing is a must to keep these dogs from running into traffic in pursuit of a squirrel or rabbit or even the neighbor’s cat. However, once you bring the dog indoors, he or she may be content to spend the whole day napping on your favorite chair. As is characteristic of most sighthounds, Whippets often sleep on their backs in what is known as a “cockroach” position, the legs raised high in the air. Now that most of our food comes in plastic wrap from the grocery store, these amazing dogs have transferred their skills to the racetrack. Many of these dogs compete in lure coursing, straight track racing, and oval track racing. Betting is not permitted, and these sports are set up totally for the dogs’ enjoyment. In lure coursing, a dog’s natural instincts are put to the test by running a lure of some kind along a wire for the dog to chase. The lure may be as simple as a plastic trash bag and may include a noisemaker to simulate the sounds made by prey in the wild. Some Whippets also enjoy flyball and agility competitions. Whippets can make good housepets, but they must be given ample opportunity for regular exercise. This doesn’t mean that they will need a 5-mile run each day, but do need to have a place to run when they want to. If they are not given this opportunity, they may become destructive, and your home may have to bear the brunt of this type of behavior. Why is the Whippet such a superior athlete? Like most athletic dogs, a Whippet has an extra-large chest cavity, allowing plenty of room for his or her heart and lungs. The Whippet’s heart is very large and beats very slowly at rest. When the dog is sleeping, his heart may even stop intermittently. A chemical called myostatin is present in all of us to keep muscles from getting excessively large. 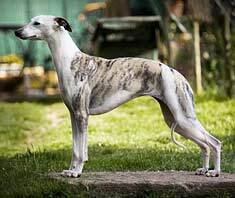 In Whippets, a mutation has been identified that prevents myostatin from performing its role. Dogs who have one copy of the mutant gene are especially fast, but those with two copies are not suited to racing as they become too large. Due to their larger, stockier appearance, dogs with two copies of the mutation are called “bully whippets”. Interestingly, the mutation has not been found in any other breed of dog. 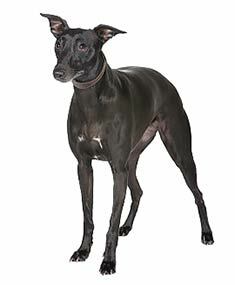 It is thought that the mutation may not have been carried forward in Greyhounds (the Whippet's closest relative) because although it allows the dog to run faster, it may not be helpful in endurance. Greyhound races are typically three times as long as Whippet races, so evolution would have eliminated Greyhounds with the mutation, while allowing Whippets to carry it forward through the generations. Another factor in the success of Whippets as racers is the very low percentage of fat in their bodies. Owners and veterinarians must be cognizant of this fact, as it effects the way in which the dog’s body processes and stores many medications, making it very easy to overdose the animal. What are the health concerns with the Whippet? As with most medium-sized dogs, Whippets can be expected to live between 12 and 15 years. There are not many genetic health problems, but eye defects have been noted in rare instances. The American Whippet Club advocates that breeders have their animals tested prior to breeding. Ask to see CERF certification for any puppy you are considering buying. This is your assurance that the breeding pair has been examined by a veterinarian, found to be free of genetic eye problems, and listed with the Canine Eye Registration Foundation. If you are looking for a medium-sized dog with very little grooming requirements and a wonderful temperament, the Whippet may be just the one. However, if you have new carpets which may suffer during housebreaking or if you cannot provide a safe fenced area where the dog can exercise, your home may be better suited to another breed. Find Whippet Puppies with our Free Breeder search!